The Jewelry Store at the El Rancho Hotel is owned by the Ortega family and features handmade jewelry from Local Artists throughout the Region. The Primary goal of the Jewelry Store is to provide you with the finest handpicked jewelry from Navajo, Zuni, and Hopi Artists. The world of art with its many branches is important to Gallup and the surrounding area. Articles have been published in the last several weeks, and even before, dealing with various galleries, events, and types of art that one can become almost overwhelmed with the structure – or non-structure – of the organizations attempting to publicize their particular passions. Confusion exists in the minds of many, especially those not involved in this field, about the fuss that surrounds this subject. While this article will probably not clear up all the questions people have, an attempt will be made to clarify exactly what is going on with the many forms of art in this area. For about three decades, Angeline Touchine stood along side her jeweler husband Ben, watching him mold silver and join precious stones together to create beautiful bracelets, rings, earrings, necklaces and more. 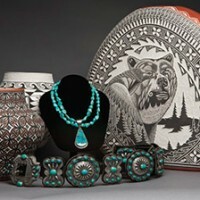 She would soon join in the business, helping him to polish and clean one-of-a-kind pieces, which give a contemporary feel to traditional Navajo jewelry. More than a decade ago, that apprenticeship soon lead to Touchine crafting her own pieces. And she would be completely on her own when Ben passed away in 2013. “I was there everyday from 1970,” she said.